Nathaniel Mackey entered my consciousness by way of some of his students, specifically poet-musicians Rich West and Eric Curkendall, who I met after I moved to Santa Cruz in 1988. They raved about his work, and hipped me to his radio program, Tanganyika Strut. I scored a copy of Bedouin Hornbook, which knocked me out on all registers, and their professor’s urbane perspective seemed eons away from our basically off-grid subterranean ontology. 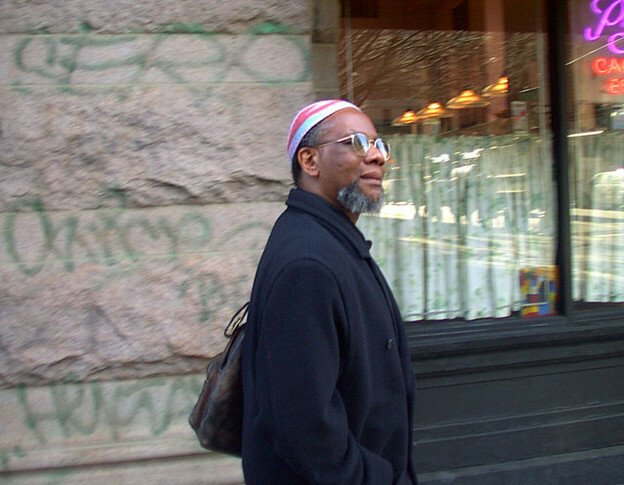 Before we met, I’d occasionally see Mackey downtown, walking along Front Street to the office supply store — and his gait and demeanor always struck me as princely (his ubiquitous kufi helped contribute to this vibe I’m sure). After we produced the We Magazine 14 CD issue (1991) I felt confident enough to introduce myself at a reading he hosted for Geoffrey O’Brien at UCSC, and then read his interview with Kamau Brathwaite in a newly published issue Hambone that furthered my understanding of what is called for in contemporary poetics. We crossed paths at Naropa that summer and talked about getting together in California. The more I read his work, the more questions arose, so the first time I went to his house I proposed to interview him. Versions of our 1991 conversation, which I transcribed from cassette, have been published many times over (Poetry Flash, Callaloo, Poetry Criticism, Paracritical Hinge: Essays, Talks, Notes, Interviews). Later that fall, Andrew Schelling, who knew of my interest in Mackey, asked me to transcribe the cassette of Mackey’s Naropa talk. Though the audio quality was poor I did so, and Mackey transformed the transcript into his essay “Cante Moro” (Disembodied Poetics: Annals of the Jack Kerouac School, U New Mexico P, 1994). Interviews I conducted with Cecil Taylor and Amiri Baraka, transcribed from cassette, are published in Hambone (1995, forthcoming 2014). A recording of the first time I heard Mackey read, at a 1992 “Poets for Peace” group reading in Santa Cruz, was released on We Magazine xv cassette. It’s hard to convey the enormity of it now, but at this time a few of us became obsessed with Mackey’s work, jokingly calling ourselves Followers of the Mystic Horn Society (referring to the musical ensemble his novels often revolve around). Since we had our own improvisationally-oriented band with conceptual dramas/foibles, lived collectively, were moved by the writing (and the music within), and were eager to know more, our reverence was sensible. It wasn’t only the writing, but also the radio show through which our horizons were expanding immensely. Mackey was superb on the radio (I have several dozen of his early 90s programs on cassette, all wonderful; some playlists are archived here). Sometimes Stephen Cope and I had contests listening to the program, to see who could name the artist and other details first. Mackey was quite tolerant, and even generous to us. For instance, if there was a song he referred to in one of his books that we wanted to hear (e.g., Frank Wright’s “China” in Djbot Baghostus’s Run), he’d find a way to play it on the show. At the same time, he was admirably discerning. In 1992, he took us up on our offer to record some poems at our studio (which turned out to be the “Zar” section of School of Udhra; see PennSound), which we recorded straight to DAT—and then became the only guest to ever request a second, “do-over”, session after the first session didn’t “sing” as it could. So we did it again, with better results. Mackey always declined our invitations to participate in our backyard poetry reading series, and to be videotaped for our VHS issue, partly because his daughter Naima was an infant I’m sure, but also because its rawness wasn’t exactly his cup of tea. Fortunately, after moving to Albany, I saw Mackey on several occasions because he somewhat regularly visited the area. In Fall 1993 I attended his “public discussion” with Brathwaite at Poet’s House in New York City. Their dialog was amiable, peripatetic, and extremely informative—particularly with regard to Brathwaite’s concept of tidalectics and his Sycorax video style—so again, I transcribed the cassette. The original transcript went through multiple iterations, finally becoming through much effort by Brathwaite a fascinating, expansive “video style” book titled conVERSations with Nathaniel Mackey (We Press & XCP, 1999). As a grad student, I recorded another interview (filed under “for research purposes only” by Mackey) and several events, including his April 1994 seminar and reading in Albany, a recitation from which (a passage from ATET A.D.) appears on the Kenning 12 compact disc. I also caught readings on DAT in Woodstock (1993), Hoboken (The New Freedoms, 1994), and Buffalo (Robert Duncan Festival, 1996), all of which are (or will soon be) available at PennSound (Woodstock, Albany seminar, and Buffalo are presently up on the SoundBox archive). A version of “Slipped Quadrant”, excerpted from the “Zar” session (above) was included as part of a multimedia composition on The Little Magazine, Vol. 21 CD-ROM. I was always glad for his presence during this period, including his candid and helpful advice with regard to tribulations that arise due to academic bureaucracy and politics, “just yes them to death”. In response to my interest in computing and multimedia, he pointed out that one can be in the process of collaborating with many elements even as a singular writer, and (circa 1994) said he needed more evidence of “breath and bone” in digital technology before committing attention to it. A few months later the marvelous compact disc he did with Royal Hartigan and Hafez Modirzadeh, STRICK: Song of the Andoumboulou 16-25, was released, full of breath and bone. I haven’t had a camera, notebook, and/or recorder activated every time I’ve been with Nate over the years since, but often I have—capturing the magnificence of his work whenever I can. Among these occasions is an interesting 2002 Modern Language Association Convention session featuring Mackey in conversation with Charles Bernstein, Juliana Spahr, Steve McCaffery, Roland Greene that I documented on minidisc. As a complement to this commentary I am concurrently releasing a reading I documented on MiniDV at Cue Art Foundation in New York City on 12 March 2004, with an introduction by William Corbett; the exhibition of Thaddeus Mosley’s sculptures in the gallery was curated by Mackey. His discriminate sensibility towards art and artifice persists. The most recent recording I made of Mackey, a blazing 2008 set he did with Henry Grimes at Cue, is an intense blast (see photos). However, his voice is not prominent in the mix; unfortunately, that's how I caught it. In all, it's a good document of the event, but in the eagle-eyed musical poet’s view, “the voice/bass mix…isn't good. I should've had a mike. The way I read, I should always have a mike! But especially so when in the company of a musical instrument”. Because “it's not the most acoustically clear example” of his work with musicians it remains offline, without qualm, and, of course, in the memory of those who attended.